The Assessment & Counseling Clinic (ACC) serves to meet the mental health needs of persons in the university, San Marcos and Hays County communities. Located on the first floor of the Education Building on the Texas State campus (see below), the ACC is a resource for people who are, or may be, in need of counseling. The ACC offers counseling for a variety of concerns to couples, families and individuals ages 3 and older. All fees at the ACC are based on a sliding scale. No individual will be turned away on the basis of payment. Counseling sessions are $20 per hour, and less for those who cannot afford that price. Your fee for counseling will be set by you and your counselor. Counseling at the ACC is provided by Master's level interns who are pursuing a graduate degree in Counseling. All interns are supervised by professors in the Professional Counseling Program, which is housed within the Department of Counseling, Leadership, Adult Education & School Psychology. If you are interested in coming to the ACC, know some one who is, or simply want more information, call 512-245-8349. Please leave a message and someone will get back with you in a timely fashion. Should your call not be returned in a timely manner, please call the ACC Director, Dr. Tracy Calley, at 512-245-5865, or contact her by e-mail. Please be advised that the clinic phone number is not a crisis support number. Should you be in a crisis, please all 911, or go to the nearest emergency room. Referrals: If you are a professional from the area, please feel free to refer clients and/or their families to the ACC. Should you want more information, feel free to contact Dr. Tracy Calley. Dr. Calley is also available for speaking engagements as a means of marketing the ACC Clinic. For more information on counseling, please see the website for the American Counseling Association or the Texas State Board of Examiners of Professional Counselors. Follow I-35 South to San Marcos, and take exit #206. Turn right onto Aquarena Springs Dr./Loop 82. After going over the San Marcos River, stay left on Loop 82. Turn right at University Dr. Turn right onto Edward Gary St. After you turn right, the Edward Gary Street Garage will be the first building on your left. The street is divided by a median, so you will need to do a u-turn in order to enter the parking garage. The Assessment and Counseling Clinic will validate your parking once you come inside. 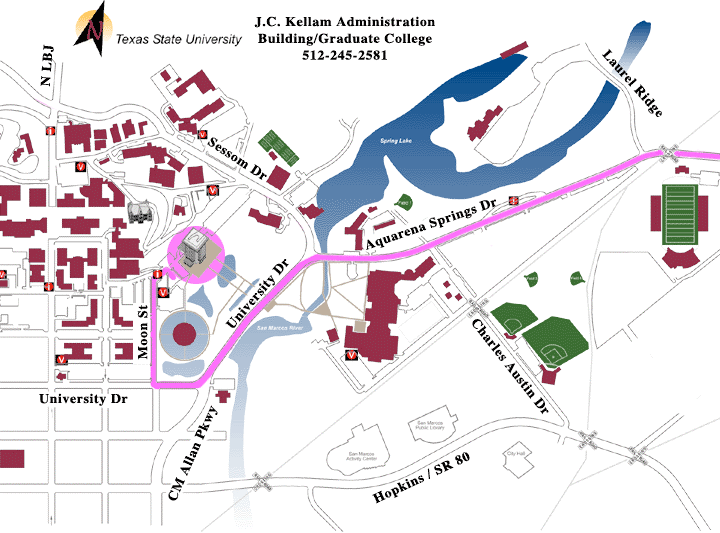 Follow I-35 North to San Marcos, and take exit #206. Turn left onto Aquarena Springs Dr./Loop 82. After going over the San Marcos River, stay left on Loop 82. Turn right at University Dr. Turn right onto Edward Gary St. After you turn right, the Edward Gary Street Garage will be the first building on your left. The street is divided by a median, so you will need to do a u-turn in order to enter the parking garage. The Assessment and Counseling Clinic will validate your parking once you come inside. The Assessment and Counseling Clinic (ACC) is about a 5 minute walk from the Edward Gary Street Garage. Walk north (toward campus) on Edward Gary St. Turn right on E. Woods St. The College of Education (ED) building will be the first building on your left. The ACC is located on the first floor of the ED building. It is wheelchair accessible, and there are signs pointing the way to the ACC. There are 3 reserved spots as well as handicapped parking for the Assessment and Counseling Clinic located on Woods Street, directly in front of the Education Building. At your first visit your counselor will give you a parking pass to use when parking in those spots.